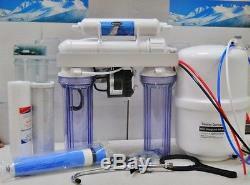 Oceanic 4 STAGE REVERSE OSMOSIS WATER FILTER SYSTEM. WITH PERMEATE PUMP ERP1000 AQUATEC 100 GPD MEMBRANE. This is one of the Best Reverse Osmosis systems in market. 1st Stage 5 Micron Sediment Filter 2.75"x9.75". Sediment filter to trap particles , including rust and calcium carbonate. 2nd Stage 5 Micron Carbon Block Filter 2.75"x9.75". Carbon filters are most effective at removing chlorine , sediment , and volatile organic compounds (VOCs) from water. 3rd Stage Reverse Osmosis Membrane 100 GPD. 4th Stage In Carbon Post Filter. For taste & Odor regulation. TYPICAL REJECTION CHARACTERISTICS OF R.
MEMBRANES Elements and the Percent R. Sodium Sulfate Calcium Potassium Nitrate Iron Zinc Mercury Selenium Phosphate Lead Arsenic Magnesium Nickel Fluoride Manganese Cadmium Barium. 85 - 94% 96 - 98% 94 - 98% 85 - 95% 60 75% 94 98% 95 98% 95 98% 94 96% 96 98% 95 98% 92 96% 94 98% 96 98% 85 - 92% 94 98%. % may vary based on membrane type water pressure, temperature & TDS. THIS UNIT COMES WITH A PERMEATE PUMP Aquatec ERP 1000. This system also comes with the following. 3.2G with storage capacity of 2.8 gallon 9" x 15". Check valve on the membrane product water side. Color code tubing for easy installation. FEATURES AND BENEFITS OF PERMEATE PUMP. Requires no electricity, powered by energy. The original Permeate Pump (ERP1000) is a simple, yet revolutionary, device. Powered only by the hydraulic energy of brine water usually lost to the drain i. No electricity required, the Permeate Pump forces product water into the storage tank, reducing membrane back pressure and maximizing available feed pressure. These pumps dramatically improve the efficiency of R.
Water production, reducing waste water by up to 80%. Permeate Pumps can also bring storage tanks up to line pressure and then shut the system down when these tanks reach capacity, eliminating the need for a hydraulic shut-off valve. Water production, superior water quality, and extended filter/membrane life. Improves recovery rates by as much as 400%. Reduces waste water by as much as 80%. Ideal for membranes rated from 10-100 GPD. Effective for inlet water pressure as low as 30 psi. Increases membrane life, lowers TDS creep. Fills product tank up to 4 times more rapidly. However, we are not responsible for transit time and delays. Under no circumstances are opened or used products accepted for return. Oceanic Water Systems REPRESENTS THE NEWEST, MOST EFFICIENT SYSTEMS IN THE INDUSTRY OUR LARGE PURCHASING POWER HAS MADE US ONE OF THE MOST COMPETITIVE ON THE MARKET. The item "Oceanic Reverse Osmosis Drinking Water Filter System Permeate Pump 100 GPD USA" is in sale since Sunday, April 22, 2012. This item is in the category "Home & Garden\Kitchen, Dining & Bar\Small Kitchen Appliances\Water Purification\Water Filters". The seller is "oceanicwatersystems7" and is located in Sylmar, California. This item can be shipped worldwide.